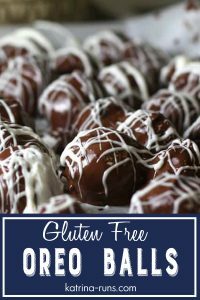 Gluten free Oreo balls are one of my easiest seasonal desserts to make. These are great for Christmas and Valentine’s Day because they are dipped in rich melted chocolate and drizzled with white chocolate. 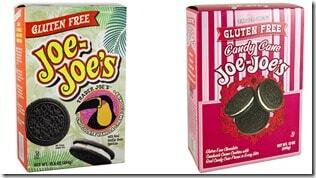 All I have to do is find gluten free chocolate sandwich cookies similar to Oreos. 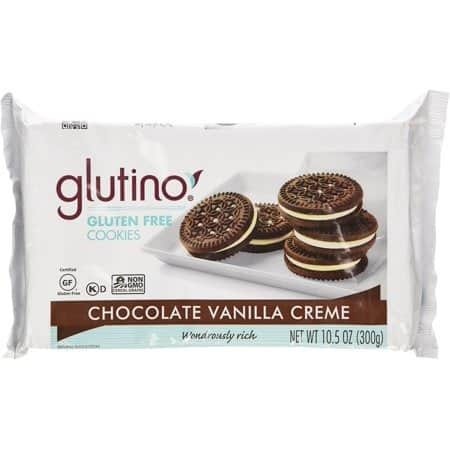 Gluten-free baking can be a challenge if I have a hard time finding substitutes, especially for traditional name-brand items like Oreos. Thankfully, several companies have a very good tasty version of this childhood classic. Once I use good chocolate for melting and add a little spice here and there, nobody would ever guess these are not the original. 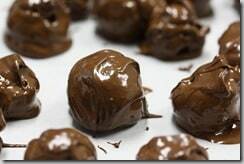 The easiest method to melt chocolate would be to use a double boiler. I do not have a double boiler. Instead, I boil water in a small saucepan and put my glass bowl of chocolate on top of 1 quart saucepan. It melts the chocolate without burning it. 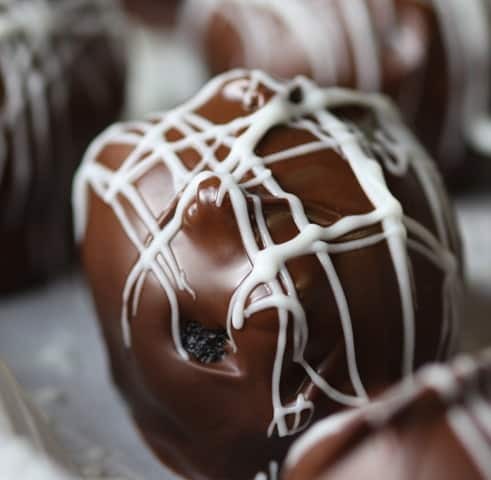 Many people have mastered the art of microwaving chocolate. I have horrid flashbacks to the time another teacher burned white chocolate in the microwave. This was over 15 years ago. The smell is still fried onto my brain like it was burned into the bowl. In previous attempts, I tried dipping them with a fork, but the balls kept falling apart. I have since tried using a toothpick and that worked beautifully. I did the dipping with the bowl of chocolate still on the saucepan so the chocolate was at the perfect consistency. 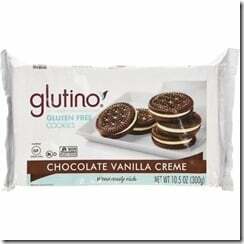 Glutino makes a great Oreo substitution and I used these for this recipe. Walmart has their Great Value brand in gluten-free! 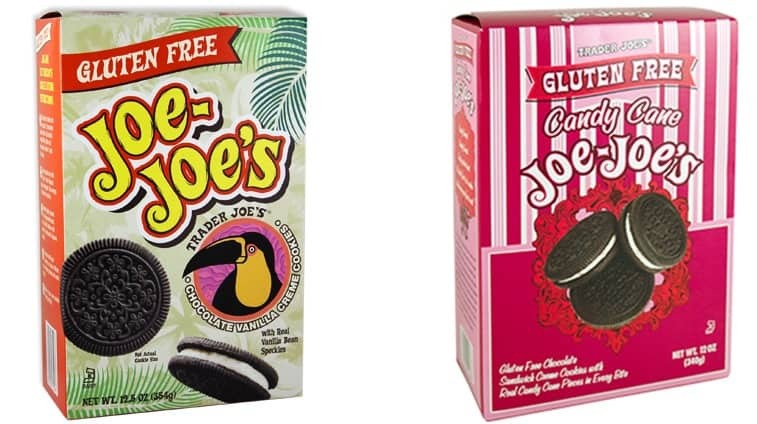 And Trader Joe’s has a gluten-free version of their Joe-Joe’s and their Candy Cane Joe-Joe’s for the holidays. 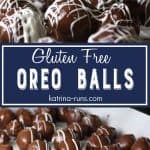 Gluten free oreo balls are one of my easiest seasonal desserts to make. 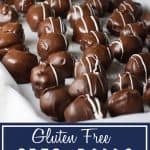 These are great for Christmas and Valentine’s Day because they are dipped in rich melted chocolate. Using a food processor, grind cookies into a fine crumble. Mix in cream cheese on low speed. Roll into balls. Freeze 15min. Melt white chips in double boiler. 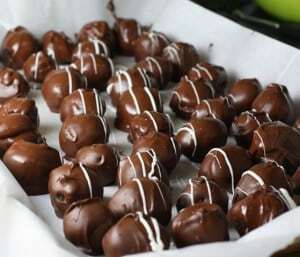 Use fork or toothpick to dip in chocolate and fling. Keep refrigerated untl ready to serve.